Every month, the Parliamentary Office of Science and Technology releases several publications, known as POSTnotes, that aim to provide an easily digestible overview of research in different areas of science and technology, as a tool for policy makers. One released this month is all about securing UK soil health, in additional to the principally-important parts about peat. I’d definitely recommend reading it if you’re interested in learning of the current status and threats to this ‘renewable resource’. Renewable is a slightly misleading word. Peat is a renewable resource if we wait about 3,000 years between harvests. Fossil fuels could also be renewable if we could hold off popping the kettle on again for another 300 million years or so. There should probably be a time frame attached to each use of renewable, and a conservative one at that, based on the Precautionary Principle. 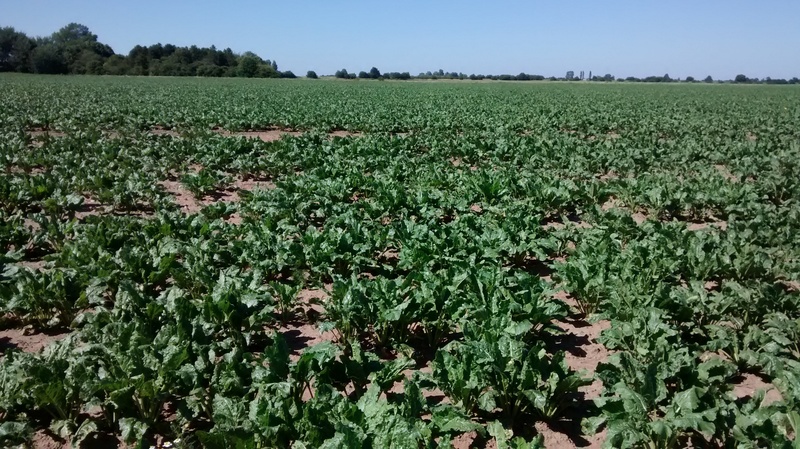 A maturing sugar beet field in East Anglia. We basically need some, or even one coherent and policeable policy that governs sustainable soil management in the UK (and Europe), so that we can adhere to the Government’s plan to “grow more, buy more and sell more British food” over the next 25 years. The world needs our sugar beet and broad beans. And we all so desperately need our soils.